1. The film implies that corn is the USA’s final crop. But if there’s no wheat, where, exactly, does the beer that Matt McConaughey’s and John Lithgow’s characters drink come from? 2. There’s no U.S. army in the film’s version of the future. But wouldn’t you want a standing army of some sort in a time when there have explicitly been large and presumably catastrophic food riots — riots so bad that NASA was encouraged to bomb cities from outer space? 3. 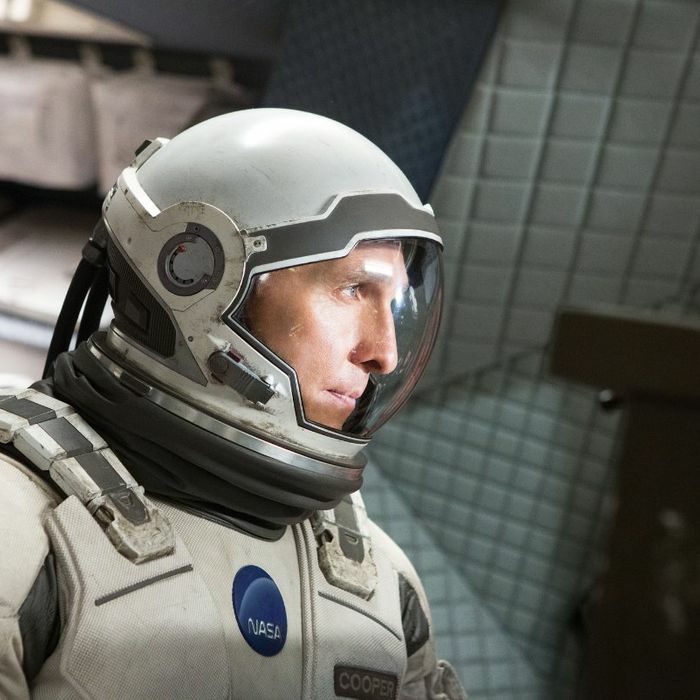 McConaughey’s character Cooper and his daughter Murph stumble on NASA, which is still being run by the presumably still-existent federal government, which funds NASA in secret so as not to provoke public opinion against it — even though NASA’s sole purpose at this point is finding a way to save humanity. That seems like exactly the kind of effort that the last remaining corn-eaters might rally behind. 4. Apparently, this crippled, army-less federal government is able to spend the presumable billions it would cost to build some kind of Noah’s Ark–like underground super-space centrifuge plus a whole fleet of cool Ranger space vehicles plus launch a series of missions into an unknown galaxy toward potentially hospitable planets through a wormhole. So where does the government get all this money that it’s funneling in secret to the officially nonexistent NASA? 5. NASA makes a big show of only sending people with no family or romantic attachments into space, and then half of their final crew has family or romantic attachments that then completely mess with their mission. Also, in the case of Michael Caine’s Professor Brand, it’s hard to make a compelling argument for sending only people with no families when you’re blasting your own daughter into space. 6. When Cooper awakens on the space-centrifuge, everything’s once again pretty hunky-dory, technology-wise, which makes it seem as if the whole human race is probably just a few billion dollars away from getting life back up and running again. And if they can grow crops on the spinning space-station, why not send that up into orbit and grow crops on it? Rather than build it in secret for a mission that’s actually a red herring, thus wasting billions of secret dollars that would be better spent on literally anything else in the world? 7. The plan of Matt Damon’s Dr. Mann is impossible to follow. Did he want to kill Cooper so that Cooper couldn’t go back to Earth but Mann could go back to Earth instead? Plus, didn’t they have two ships? Why did Mann even care if Cooper left? Or was his plan to leave both Cooper and Amelia Brand to die and take the fertilized eggs to the next planet, where that third person was? If so, why did Cooper (or Cooper plus Brand) have to die for him to do that? Couldn’t he just say, “Hey, let’s all go to the other planet, or at least anyone who wants to?” Or maybe he’s just gone space-crazy? 8. The elderly Murphy Cooper spends two years in a space-travel cryo-freeze, apparently two of the very last years or her life, to finally be reunited with her father — and she more or less chases him out of the room after a couple minutes. 9. If Cooper was the ghost who pushed the books off the shelf and sent the message to his daughter in the past, why was his message stay? Who was he telling to stay? Not Cooper, surely, because then the whole movie doesn’t happen and Earth is doomed, right? So Murphy is supposed to stay? Stay where? 10. It’s awfully hard to believe that complex astrophysics could even be rendered in Morse code. Basically the premise is that the final piece of evidence needed to unlock “gravity” and solve the long-standing equation that would allow NASA to launch that superstation was unknowable and could only be glimpsed inside a black hole. but could also be relayed via Morse code? Like, here’s the secret to the universe stop better grab a pencil stop? 11. Future advanced humans — so advanced that they actually live in five dimensions — set up a whole scenario so that Cooper would be able to tell himself where to find NASA. Yet the best means of communicating with the past is the malfunctioning secondhand of a wristwatch? 12. What’s the point of all the remaining educators conspiring to teach that the moon landing was faked? All the educators in America decided that the corn-eaters were still too hopeful and thought, Let’s perpetrate this one great lie, just for kicks? 13. We’re in a future with no armies and a barnstorming version of the New York Yankees, yet there are also not only textbook companies, but textbook companies that diligently issue corrected editions. 14. Who would have been the spaceship pilot if Cooper hadn’t shown up? Would NASA have called him eventually? It seems weird to entrust the future of humanity with a semi-random trespasser. 15. Michael Caine’s character, Dr. Brand, is supposed to age 23 years over the course of the film. Yet he looks exactly the same throughout. 16. It seems problematic for Anne Hathaway’s character, Amelia Brand, to be left to raise hundreds of babies all by herself. 17. Cooper sure is able to hijack a spaceship pretty easily there towards the end. 18. Mackenzie Foy, the actress who plays the young Murph, looks more like Anne Hathaway than she does Jessica Chastain, who plays the adult Murph. 19. Casey Affleck, as adult Tom, has a higher voice than Timothée Chalamet, who plays young Tom. It sounded like the character was going through reverse puberty once Affleck appeared. 20. Why is Topher Grace in this movie? Nothing against Topher Grace, but casting him in a small part like the one he plays guarantees that everyone in the audience will, at least momentarily, be drawn out of the film to think, Hey, is that Topher Grace? 21. Finally, and perhaps most important: If Cooper saved humans from the fifth dimension, opened the wormhole, and engineered the whole sequence of events by which Cooper instructed his past self and his daughter on how to, basically, save humanity — well, how did those future humans get saved? Which is to say, you can’t travel back in time and engineer your own salvation. Don’t you first have to be saved, so that you will exist in the future to travel back in time? This isn’t a “chicken or the egg” question as much it is a “chicken travels back in time and lays egg that hatches and becomes that chicken” question, and that’s impossible, right? Or is the answer just “love and wormholes and love and Dylan Thomas”?